If Jackie McLean’s career would’ve ended right after recording A Fickle Sonance, people would certainly have pointed out the alto saxophonist’s development from one of Charlie Parker’s most proficient disciples to an alto saxophonist that made his mark with a series of excellent Blue Note recordings from 1959 to 1961, employing his highly emotional, piercing sound: already a great legacy. However, McLean raised the bars considerably the following years, breaking and entering hard bop’s living quarters with a series of vanguard recordings in cooperation with avantgardists like Ornette Coleman. Fickle means ‘liable to sudden unpredictable change’. Sonance is an archaic synonym of ‘sound’. By calling his album and title track thus, McLean reveals to be a conscious commentator of the dual nature of both his own sound and style and jazz in general, which is all about surprise. All Music states that ‘the playing’ on A Fickle Sonance ‘remained in a swinging, blues-oriented style, showing no hints of the direction his music was about to take’. Not entirely accurate. The title track certainly foreshadows McLean’s modal jazz. 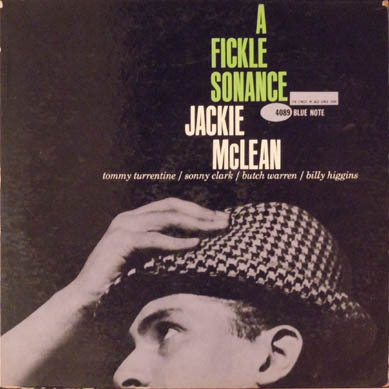 McLean’s solo in A Fickle Sonance borders on the abstract. The angular quality of McLean’s lines and his probing, biting tone set McLean apart from his contemporaries. He’s a passionate player with a dark-hued sound, involving macabre, if occasionally frivolous overtones. A fickle sonance for sure. The way McLean lends substance to ballads was striking as well. McLean’s powerful statements on his original composition Subdued suggest a passionate singing voice. Tunes like Sonny Clark’s Sundu, Tommy Turrentine’s Enitnerrut (Turrentine spelt backwards) and Butch Warren’s Lost fit into the ‘codified’ Blue Note message: deceptively effortless hard bop tracks from a rhythm section that would work together two weeks later on Sonny Clark’s splendid swan song as a leader, Leapin’ And Lopin’ on November 13, 1961. Sonny Clark’s Five Will Get You Ten is more unusual. It’s a rip-off from one of Thelonious Monk’s unreleased cuts, Two Timer, that Clark presumably overheard Monk play and plagiarized in order to raise quick cash for his increasingly alarmous drug habits. (Monk never found out, but undoubtly would’ve forgiven the younger Clark, who was taken under his wings by Monk for quite a while at the famous jazz mecenas Nica “Pannonica” de Koenigwarter’s residence) Clark’s title arguably alludes to the drug scene; ‘five’ would be cash, ‘ten’ would be a certain amount of dope. Who wouldn’t kill for an unreleased Monk track? It’s an alluring tune with a bridge that resembles Bemsha Swing and McLean jumps at the opportunity, alternating note-bending wails that stretch the boundaries of the melody line with rapid glissandos. Monk’s tune is fitting, since in A Fickle Sonance’s set of tunes, air and spaceousness are dominant features. To create a relaxed atmosphere while operating on a strikingly emotional as well as a highly proficient level is no small feat of Jackie McLean’s outstanding quintet.